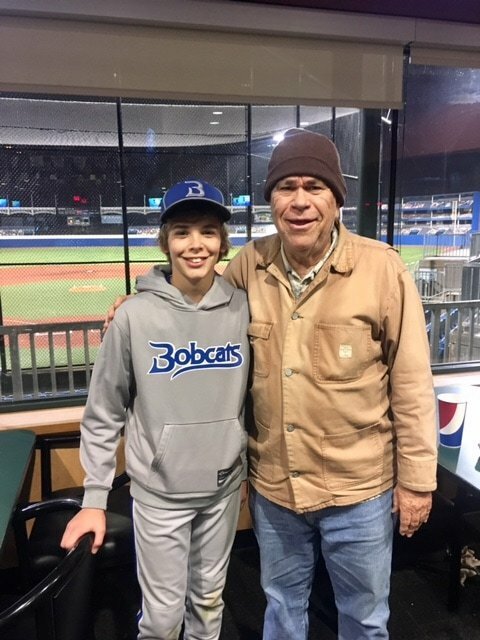 Durhl and grandson Luke Caussey at a Mansfield Varsity Baseball game. COMMENTARY—Somewhere around midlife, you realize that many of the dreams you had as a little boy and nearly all the hopes you had as a young adult have been lost into the abyss of existing pursuits. It is not that success has been denied, but rather your life stream has been altered. The rocky shoulder of making a living and the demanding coves of raising a family have become more important and commanding. We give up our dreams to impossibility, recognizing them as a contentment compartment of what could have been. We place those lost dreams in our pocket for safekeeping. Along with the pocketknife, top and string, dried horned toad, and a Bull Durham sack containing the treasured cat-eyed-marbles that have also disappeared with the passage of time. From the time I was seven until I turned a ripe old age of 15, I lived, slept, and dreamed baseball. The walls on the old screened porch that was my room were covered with the pictures of Pee Wee Reese, Mickey Mantle, Harmon Killabrew, and the immortal Duke Snyder. A well-worn, softly grass- stained Spaulding glove was my constant companion. The glove provided the anchor to my belt throughout elementary school. The only time the glove was left at home was when my folks made me go to church. I found the preaching much too long and the music unbearably loud as my mind wondered back to the dresser on the porch that cradled the beloved, sacred glove. I slept at night with my glove. Before drifting off to sleep, I would toss the ball into the air and catch it as I lay on my back with the street light providing streaks of silhouetted light. And I dreamed. It was the bottom of the ninth and my team, the Brooklyn Dodgers, was ahead of the hated Yankees in the seventh game of the World Series. I was playing center field and Roger Maris was the batter, with two outs and one on. The Dodgers were ahead by one run. The count is full. I am standing near the warning track at Ebbets Field. Sandy Koufax delivers the pitch and Maris swings. It is a deep hit ball, headed for the fence in center-field. But then, just before the ball lands in the stands, I leap with a Herculean effort and catch the ball in the cone of my glove. Maris is out and I am the hero. Sometimes, when I was afraid of the playground bully or the teacher scolded me for my poor study habits, I relived the dream of that miraculous catch. The roar of the imagined crowd and the smiles of my teammates made my failures more bearable. Later on, as an adult with a failed marriage and the loss of everything I loved, I again escaped into the dream of my youth. I became a hero again. No longer living under a bridge near downtown Fort Worth and working as a day laborer, I was the player who saved the 7th game in the World Series. As a young man, I got to visit Yankee Stadium and watch the Mick hit a home run into the right center field bleacher. As an older man, I got to take my son, Christopher, to meet Duke Snyder when I was writing an article about him for a sports magazine. I told him of my dream. He smiled and confided that as a young boy he too had such a dream. A few years ago my oldest son, Chad, started a family tradition. All the Caussey boys go to the first game of the season at the Ball Park in Arlington to watch the Rangers play. Granddad, sons and grandson watching baseball together. Since this column is one of truth, it is only fitting that you know just what kind of player I was back in my youth. Maybe this poem can explain more fully. Closed fist over closed fist. knowing I will be last. are left to choose from. Oh God!—surely they will take me before her. reserve pack in jean pocket. Finally my name is called—Goober. I’m not last after all! plentiful manhood at last restored. Durhl Caussey is a syndicated columnist who writes for papers across America. He may be reached at this newspaper or dcaussey@sbcglobal.net. Durhl Caussey is a longtime educator who writes for several outlets including Focus Daily News. His award-winning columns appeared in the Oak Cliff Tribune from 1998-2009. He also covers automobiles and sports. A past president of the Press Club of Dallas and the Oak Cliff Lions Club, he and his wife live in Oak Cliff. He also belongs to Texas Auto Writers Assn., Texas Outdoor Writers Assn. and North American Travel Journalists Assn.